during the next Classic Days. many personalities will be there. especially designed in the Classic Days' image. each BRM watch is a unique piece. A real success... all gone ! Much more than a thought ! passed away the last August 8th, struck down by illness. A huge man left us ! Live again the Classic Days 2008’s atmosphere ! rolling sessions, charm and intense pleasure… Everything’s in! Watch the video right now ! 2009... Registrations are opened ! During the 2nd edition, the 1st & 2nd May, 2009, we will pay a homage largely deserved to Sir Tico Martini. the history of the circuit of Magny-Cours. did not have a heart ? 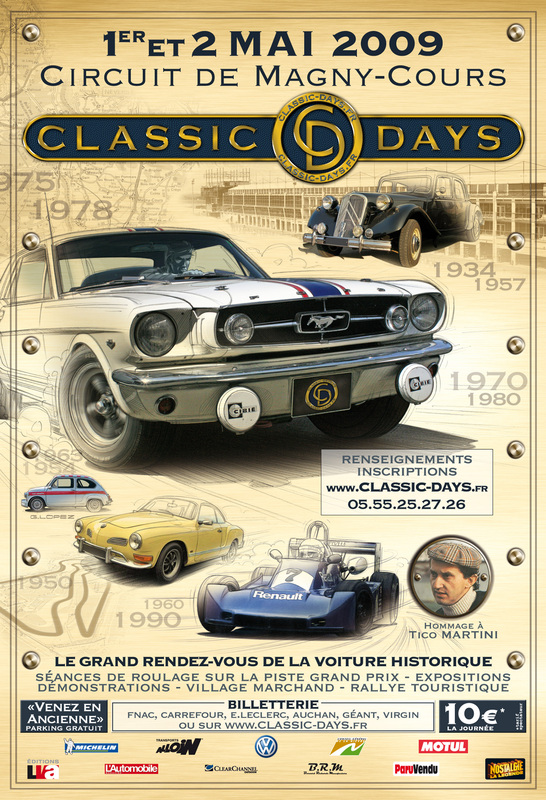 The date is scheduled for the 2nd edition of the Classic Days. to this great car festival. Many thanks to the Committe of Honor! Eric Hélary, Dany Snobeck, Guillaume Lopez, and Max Mamers for their presence and availability. We announced the presence of other friends of ours including our godfather, who met some difficulties that unfortunately prevent them to join us and they apologize for this. Jean-Pierre Jabouille, our godfather did not come because of a significant personal problem, Guy Ligier had reluctantly to stay on his hospital bed, and Henri Pescarolo met some troubles in Monza in LMS that prevented him to join us. Everyone apologized not to be able to come and pomised to turn up for the next edition. You have the possibility to register directly on site this weekend. As a last resort, you will be able to register you on the spot. Anyway, this car will leave the Classic Days bright and spruce!! The indoor car park is from now on FREE. D-10 : we keep growing ! Henri Pescarolo will join us ! confirmed us its presence to the Classic Days! You will have thus the pleasure to meet this French car sport legend in the paddocks during the event! the 'Sport Auto Marché' that lasted 4 years (from 1968 to 1971) in the heart of the Magny-Cours circuit. The countdown has began !